Here I am with another NOTW! 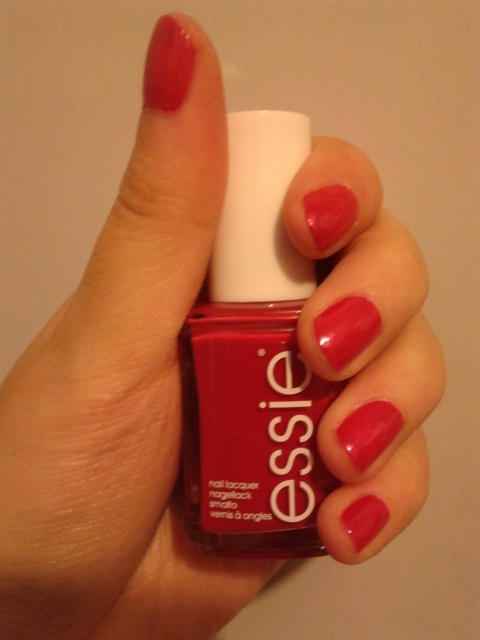 She's Pampered is an indulgent (as they say on their website) red and makes part of the 2012 Winter Collection. It would be ideal to apply 2 coats, but I only put on 1 coat in the picture above. I must admit that Essie chips quite easily on me, so it's a bit disappointing that I pay that much money (Essie is in the average price range in Belgium). Nevertheless, I love the cream formula and how opaque Essie colors can be. Not to mention that Essie is known for their DBP, toluene and formaldehyde free formula, yay! I only buy Essie if I'm totally in love with the color.